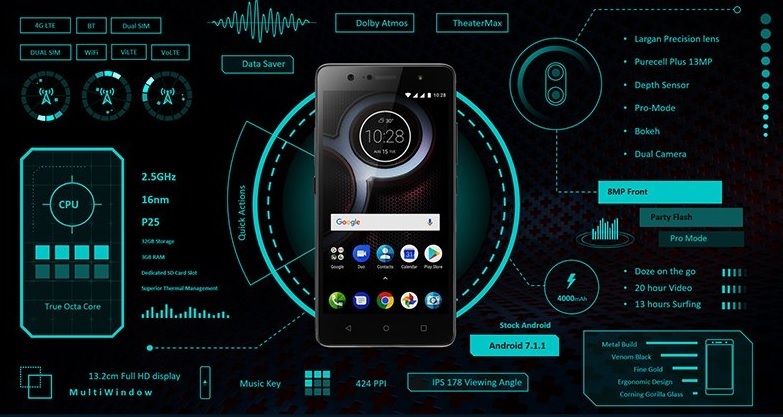 The Lenovo K8 Plus 4GB RAM comes with a gorilla class to protect the display. In addition to that, it has an Oleophobic coating. This means you don’t have to worry about smudges or scratches. It sports a 5.2-inch IPS LCD Full HD display that offers a resolution of 1080 x 1920 pixels. It is easy to operate the phone with one hand. For a phone priced so reasonably, one would not expect two processors. This is how The Lenovo K8 Plus surprises everyone. It has two processors (2.6 GHz Cortex A53 Quad core and 1.6 GHz Cortex A53 Quad core) which are paired with MediaTek MT6757CD chipset. You can also play 3D games and stream high definition videos thanks to the Mali-T880 MP2 graphics processing unit. It runs on the Android v7.1.1. Nougat. The Lenovo K8 Plus has impressive cameras, to say the least. On the rear, it has dual cameras. There is a 13MP and a 5MP camera with a depth sensor. These cameras have an aperture of 2.0f. It is great at Autofocus and has other features like continuous shooting, LED flash, high dynamic range mode, face detection, etc. and on the front lies a 8MP unit which is also equipped with LED flash. The internal storage of the device is merely 32GB. But thankfully, it can be expanded up to 128GB using a microSD card. The Lenovo K8 Plus is fueled by a 4000mAh battery which is out of the box for this price. It can deliver hours and hours of talk time. The Lenovo K8 Plus is loaded with connectivity options as well. It has 4G support, Mobile hotspot, GPS, WiFI, dual SIM, etc. The only thing it lacks is NFC. It also has light and proximity sensors, gyroscope, and an accelerometer. The fingerprint sensor is on the rear panel and responds quickly. The Lenovo K8 Plus is the answer to your prayers if you wish for premium level specifications at a reasonably competitive price. This device not only has huge RAM, but also packs decent cameras and good battery life. Lenovo has definitely stepped up its game with this phone. It comes with a dual camera which was previously done by Xolo, but this one is slightly better in terms of quality. It is a great deal for the budget conscious people out there. The Lenovo K8 Plus is priced at INR 9999 only in the Indian market. What colors is the phone available in?The Lenovo K8 Plus is available in Venom black and fine gold. What are SIM cards required for The Lenovo K8 Plus?The phone accepts two Nano-SIM cards. Does the phone support USB OTG?Yes. The Lenovo K8 Plus provides USB OTG connectivity. Can I stream 4K videos?No. Only full HD videos are supported by the phone. 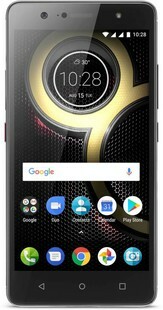 Lenovo K8 Plus full specs and reviews as of Apr 2019. Buy it here!